The R&S SMR50/60 are CW generators with pulse modulation capability and a lower limit frequency of 1 GHz. They cover the range up to 50 GHz (SMR50) and 60 GHz (SMR60). The lower limit can be expanded to 10 MHz by the Frequency Extension 0.01 GHz to 1 GHz (option SMR-B11). Owing to their excellent price/performance ratio the two models are ideal for economical microwave test setups up to 60 GHz. Should the measurement tasks become more demanding, both models can be upgraded any time by means of options to give an AM/FM signal generator or a synthesized sweep generator featuring fast, fully synthesized, analog ramp sweep. The SMR50/60 stand out from other generators for their excellent spectral purity. Advanced frequency synthesis makes for low SSB phase noise and high spurious suppression, both of which are for example prerequisites for reliable receiver measurements. Special microwave filters in the output path of the instrument ensure excellent harmonics suppression. This is necessary to obtain unequivocal results in scalar network analysis measurements. 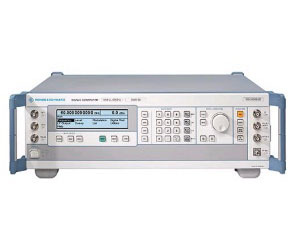 Microwave signal generators are frequently used for calibrating test receivers. This task calls for a highly accurate and stable output level settable with high resolution. This is ensured by a high-precision, frequency-response-compensated level control. A minimum level of –20 dBm can be set. This range can be extended to –110 dB with the optional RF Attenuator SMR-B18.